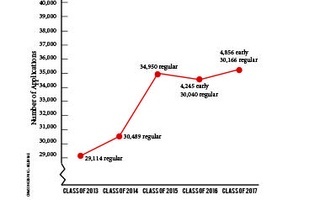 Harvard College received 39,044 applications for admission to its Class of 2020—setting a new record for admissions the second year in a row and surpassing last year’s 37,305 total applications. Fitzsimmons also said headline-grabbing donations to Harvard from former Microsoft CEO Steve A. Ballmer ’77 and hedge fund magnate John A. Paulson increased Harvard's visibility and could have factored into the application increase. “All of this helps gets the word out for us, not just around the country but also around the world,” Fitzsimmons said. The increased number of applications was accompanied by deepening interest in a variety of academic areas. Director of Admissions Marlyn E. McGrath said in a press release that applicants interested in studying the humanities had increased by 7.6 percent, continuing an upward trajectory. “In some ways, you could argue we’ve been doubling down on the humanities in the past decade or so,” Fitzsimmons said, adding that recent admissions presentations and online information for applicants have highlighted Harvard’s strengths in those fields. Fitzsimmons added that increased resources at the School of Engineering and Applied Sciences—which was renamed for Paulson last year after he donated $400 million to establish the school’s endowment—as well as the accomplishments of former Harvard students in the tech industry, like Ballmer and Facebook CEO Mark E. Zuckerberg, provide “a very persuasive set of possibilities” for students contemplating careers in engineering and computer science. While applicants’ stated academic interests changed, the minority racial and ethnic composition of the applicant pool barely budged from last year’s numbers: 21.1 percent identified as Asian American, 12.2 percent as Latino, 10.6 percent as African American, and two percent as Native Americans and Native Hawaiians. The gender composition of the applicant pool was split nearly even, with women making up 49.3 percent of this year’s applicants. “There is intense competition for top students of all kinds, including minority students,” Fitzsimmons said. He called Harvard’s efforts to recruit qualified minority students “very aggressive,” but added that many other colleges and universities do the same. 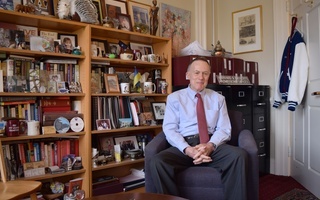 “If everybody is doing that every year, it’s hard to move the needle very far in one year,” Fitzsimmons said, adding that the more diverse “alumni and alumnae” the College graduates, the more likely they will help recruit and interview applicants to future Harvard classes. 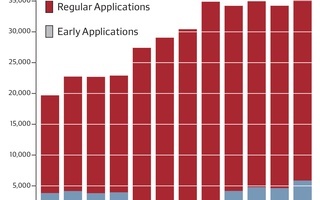 Harvard’s peer institutions also reported new highs in their application pools. Yale received 31,439 applications, according to the Yale Daily News, while the Daily Princetonian reported that Princeton saw 29,313 applications. Both numbers of applicants were record totals for their respective schools. Harvard has already offered admission to 918 students to the Class of 2020 through its Early Action program. 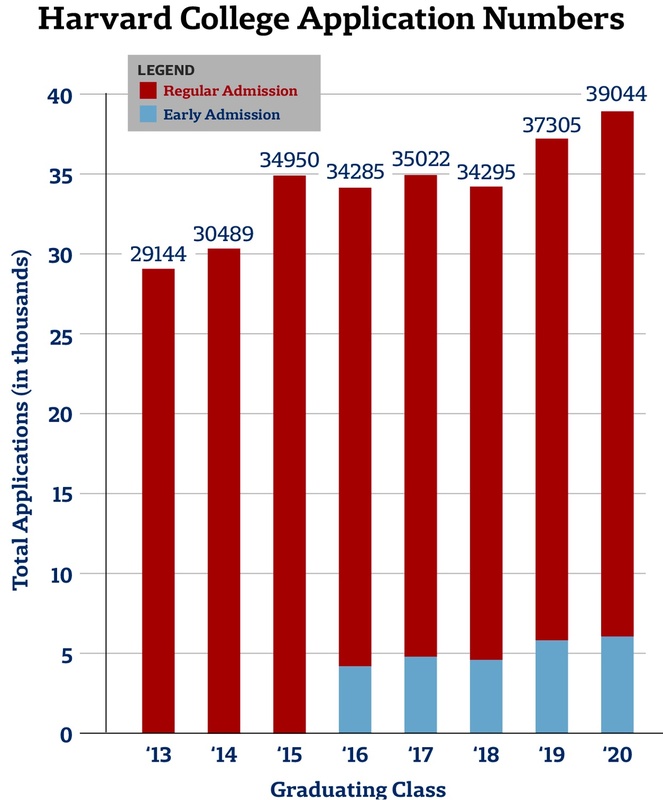 Only 14.8 percent of early applicants were accepted in December—the lowest early acceptance rate since the program was reinstated in 2011. Last year the College accepted a record low number of applicants from its admissions pool, just 5.3 percent of 37,305 applications. The Crimson was granted early access to applicant statistics and an interview with Fitzsimmons under the condition that it not release the information until Tuesday morning.